Gasket Set, K-14 85-98 - August Industries Inc. 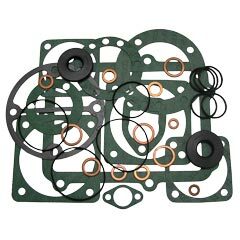 This BAUER gasket kit includes all the necessary gaskets, o-rings, copper seals, and oil seals necessary to replace all seals on a BAUER K-14 compressor block built between 1985 through 1998, with block numbers ending in either /7 or /8. Please note that the illustration is for reference only, actual kit will contain all necessary seals for the appropriate compressor model.